Separated from the southern end of Stromness in Orkney by the town's golf club is Ness Battery. The sign on the gate declares it to be "one of Britain's best-preserved wartime sites" and it is easy to see why. What you find here are the concrete remains of a gun battery that during WWII helped guard the huge and hugely important naval anchorage at Scapa Flow from surface attack. What really sets the Ness Battery apart is that you also find here many of the wooden huts that would have accommodated those manning the guns. These are superbly-preserved and one of them comes complete with a magnificently large and deeply poignant mural depicting scenes of rural Kent. Visits to Ness Battery are by guided tour, and details can be found via the links in the Visitor Information section of this page. Suffice it to say that we'd highly recommend a tour as bringing to life an important part of Orkney's history, and, more widely, of our parents'/grandparents' history (depending on your age). Scapa Flow was the main base for the Royal Navy during the war, and pretty much everything that happened on the islands revolved around defending that base. At the beginning of the war, the defences were flawed. A German U-Boat found its way into the anchorage and sank HMS Royal Oak in the early hours of 14 October 1939, with huge loss of life. A few days later the Royal Navy's flagship, HMS Iron Duke, was so badly damaged in an air raid that it had to be run aground to stop it sinking. But over the months that followed, the defences were brought up to a formidable standard. Anti-aircraft defences were provided by 88 heavy anti-aircraft guns around the anchorage and many lighter guns, plus the guns of the fleet. There were also four military airfields built in Orkney. The last major air raid took place on 10 April 1940, with the "Orkney Barrage" proving so successful that the Luftwaffe thereafter restricted themselves to minor pinprick incursions and attacks. Anti-shipping and anti-submarine defences included blockships and the steadily growing Churchill Barriers, controlled minefields, boom defences and anti submarine nets. A key component of the defences against surface ships was a series of heavy gun batteries sited to control the approach channels to Scapa Flow. Ness Battery was one of these. The site had also been the location of a defensive gun battery during WWI, but most of what you see on the ground today dates back to WWII. Ness Battery had two 6-inch guns in concrete emplacements, plus all the support infrastructure to service and control those guns. 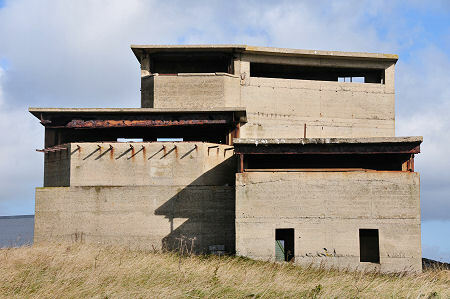 The battery also served as the headquarters for five other gun batteries which helped cover access to Scapa Flow from the west. 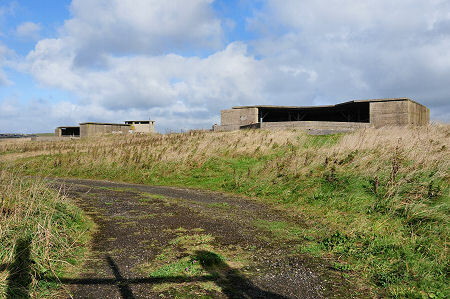 After the war, Ness Battery remained in use as a military camp, and was handed over to Orkney Islands Council by the Ministry of Defence in 2001. This helps explain the almost unique survival of some of the accommodation huts. In 2009 a programme of restoration and stabilisation began, and this led to Ness Battery being opened to guided tours. You reach Ness Battery by following a minor road past the front of Stromness Golf Club. This sticks closely to the shore as far as a parking area, en route passing a gun emplacement and a searchlight emplacement that belonged to Links Battery, one of the other batteries controlled from Ness Battery. The Ness Battery is a short walk up a gentle hill from the parking area. Your tour takes in one of the gun emplacements: we wonder who else thinks of "The Guns of Navarone" on seeing the amazing view from inside the emplacement. En route you pass and discuss other buildings on the site, such as the underground magazines, one for each gun emplacement and the small arms store. The site's most prominent feature, the Battery Observation Post and Fire Command building isn't currently open to tours, but it remains an ever-present reminder of the need for continuous watchfulness during the war. The mess hall at Ness Battery is simply breathtaking. 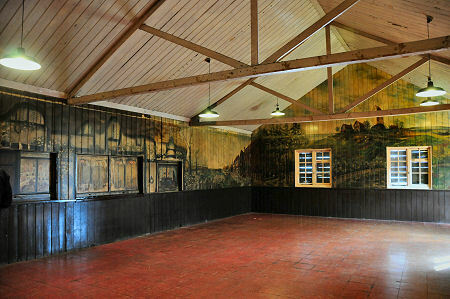 Three of the internal walls of a very large room are covered by a huge mural that depicts painted scenes of rural Kent: the unpainted wall was home to a stage. The mural is signed "A.R. Woods" and is seems highly likely that this was Albert Rycraft Woods. He worked as a piermaster for the Port of London Authority and is never recorded as having been in Orkney, but the scenes depicted tie nicely into memoirs he published in 1942, and the style of the mural matches closely paintings of his that have survived, three of which are on display in the mess hall. It is assumed that Woods came to Orkney to accompany floating cranes and other equipment supplied by the Port of London Authority for use by the navy in Scapa Flow. He must have been here for some time, simply to have been able to complete such a large-scale project. You'd have to say that there is a certainly naivity of style to the murals, and you'd also have to say that they carry evidence of decades of nicotine discolouration; except for an area depicting travellers' caravans that has been restored. Meanwhile, one small area was obviously used to mount a dartboard. But it seems nothing short of a miracle that the mural has survived as it has, and while it lacks the overtly spiritual dimension that makes a visit to the Italian Chapel such an uplifting experience, the scale of the endeavour and of the achievement is comparable. So, and at the risk of repetition, if you are in Orkney and want to get a feel for one of its more recent layers of archaeology, we'd highly recommend a tour of Ness Battery.